Devin Arkison was a 3x All American at Hobart. Devin Arkison (Devo) has coached lacrosse in Orange County for several years. Devo was the defensive coordinator for San Clemente High School where he helped the Tritons win a conference championship in just their second season of existence. He then spent four years at Corona del Mar, helping the Sea Kings to a perfect record and CIF title in 2012. Four of his defensemen committed to Notre Dame, Denver, Rutgers and Drexel. Arkison is considered by many college coaches to be one of the finest teachers of individual skill sets applicable to the next level in the country. Prior to coming to Orange County, Arkison spent four seasons coaching at his high school alma mater Summit NJ. He led the team to the state semi-finals in a rebuilding phase. As a player, Arkison was a 3-time All-American at tradition-rich Hobart College. He was also a member of 4 National Championship teams. 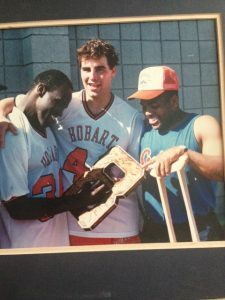 Devin was in the first class inducted into the New Jersey Lacrosse Hall of fame. In addition, he was named First Team All-Century for NJ High School lacrosse. A proud graduate of Summit High Devin was a member of 2 State Championship teams. Individually he was named All-American, First Team All-State and player of the year as close defensemen. Other coaching experiences include City Lacrosse LA. Stuart Lacrosse Club, Adelaide Australia. Starz, Victory Lacrosse, Quiksilver Lacrosse Club, Adidas Lacrosse, Kings Lacrosse Club.